Each of our graduate students is expected to present their research in an annual mini-seminar. Mini-seminars occur approximately every other week with two graduate student speakers per session. Attendance at these mini-seminars is mandatory for all graduate students. The Biological Sciences Department is proud to present our Friday Seminar Series, supported by the Scholl Endowment. Eminent scientists are invited to the department to deliver seminars, and students have ample opportunity to engage these scientists in individual or group conversation. 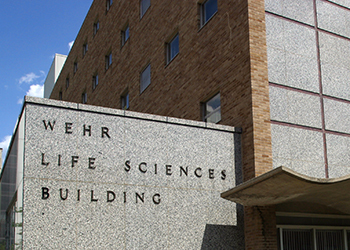 Seminars are held at 3:00 pm on Friday afternoons in Wehr Life Sciences 111. Our 32th annual Oliver H. Smith Memorial Lecture honoring the memory of Dr. Oliver H. Smith, a faculty member in the department from 1963-1985. The seminar series was established by Oliver’s family who has continued to support this and other important departmental programs. Previous Smith Lectures have included three Nobel Laureates: Dr. Elizabeth Blackburn (1993), Dr. Richard Roberts (2001), and Dr. Thomas Steitz (2002). May 4th, 2018 "To build a biofilm"